Airtel subscribers am bringing to your court how to surf Airtel 2GB plan and be able to use it on 3G Network freely. Before then, hope you all know that Airtel 2GB or 6GB for N200 or N500 data plans doesn't allow users to opt out once you opt in for any of them. 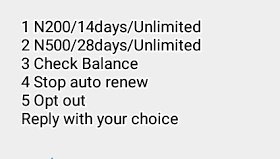 So, that means once you subscribe for the data plans, you cannot be able to use other Airtel Subscription on that very sim since you cannot opt out. But you can still flex this particular Airtel data plan by using another sim or you can still use your main sim since it doesn't change the fact that the sim is yours. Hope you all know that ZOTO Free Airtime Promo is ending to night, so if you are yet to get your own free #6000 airtime and above, now is the opportunity, don't miss out, click Here to get started now. Now, below is the secret and tips behind making your Airtel 2G data plan browse so fast and work on 3G Network freely. 2GB will last for 14days and 6GB will last for 28days. Dial *482# and follow the prompt message. Now, on the smartphone that contains the 2GB data package, just switch on your Mobile hotspot, and tether it to the other device, while you connect with your WiFi and the speed will be greatly increased. That's all, enjoy the speed in connection. Tell us how yours is connecting.